Home Education Going Back to School? R.E.L.A.X. Going Back to School? R.E.L.A.X. 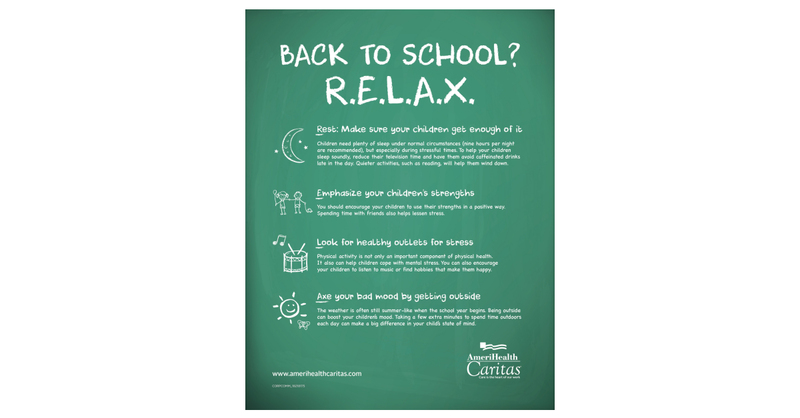 PHILADELPHIA–(BUSINESS WIRE)–Going back to school can be both exciting and stressful for children. There is the excitement of a new year and the new opportunities presented by advancing a grade level. But this annual occasion also marks the return of homework, exams, social pressure to compete with their classmates, and other challenges. This can lead to stress, which can take a physical and mental toll on children. 1 “Back to school: Exciting and stressful!” Healthy Now (Select Health of South Carolina member newsletter) Summer 2017: p. 5.